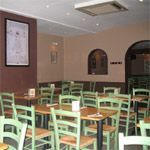 Da Vinci is a modern restaurant that offers a varied selection of Italian fare. Favourites include risotto, lasagne and delectable desserts. Do you work at Da Vinci? What did you think of Da Vinci?